T.J. Miller says the Shock Top Super Bowl 50 ad will be the greatest Super Bowl ad of all time. We see about that, but the teaser video for the Shock Top Super Bowl 50 ad is funny. T.J. Miller, who plays Erlich Bachman in the HBO sitcom Silicon Valley, is hilarious talking with the Shock Top mascot Wedgehead voiced by comedian Martin Montana. Shock Top VP, Jack Kirsch told Adweek that the teaser was improvised. It sound like it was. At the end he drops a full glass of Shock Top like a mic. Watch the Shock Top Super Bowl teaser below. Anheuser-Busch InBev is giving one of its many Super Bowl 50 ad slots to the wheat beer brand Shock Top. The California brewed wheat beer brand is aiming at Miller Coors Blue Moon with the first ever Shock Top Super Bowl commercial. 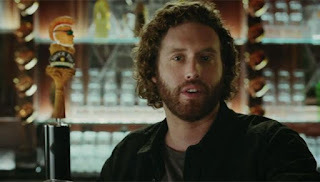 T.J. Miller will star as Weasel in the highly anticipated movie Deadpool, in theaters Feb. 12. I would not be surprised if there will be a Deadpool Super Bowl 50 trailer.